Juliana M. Lesher’s career and spiritual journey caring for patients and Veterans in need has taken her west to Los Angeles, north to Fargo, south to San Antonio and east to Washington, D.C., where she now serves as the U.S. Department of Veterans Affairs (VA) National Director of VA Chaplaincy. Yet the constants of her 20-year clinical pastoral career remain: faith in God, dedication to care for those in crisis and meaningful relationships with the nation’s Veterans. After just a few months of being sworn in to her new job at the National Chaplain Center, a position within Care Management and Social Work in the Office of Patient Care Services, Lesher described her career trajectory and the role of Chaplains at VA.
Having been repeatedly denied military waivers to serve on active duty due to a spinal condition, Lesher notes, “the open door that God had for me to serve our nation’s heroes came with the opportunity for a ministry career at VA.” She started serving as a VA Staff Chaplain at the William S. Middleton Memorial Veterans Hospital in Madison, Wisconsin, where she ministered to Veterans with substance use and mental health issues and those undergoing organ transplants. Lesher has served as a Chaplain in VA and other facilities such as trauma centers, healthcare facilities and prisons in Pennsylvania, California, Wisconsin, Kentucky, North Dakota and Texas. Like Lesher, those who choose VA careers as Chaplains also play an integral role in patient care for Veterans. As members of the patient-aligned care team, Chaplains protect patients’ constitutional right to the free exercise of religion — and the right to not have religion imposed — and, if asked, offer faith-based counseling in a number of areas. Every VA medical center has Chaplain coverage 24 hours a day, and spaces for prayer and meditation. Lesher has counseled polytrauma patients, Veterans undergoing transplants and the family members of hospitalized Veterans. Lesher’s leadership career came more into focus in June 2011, when she arrived for the start of a seven-and-a-half year period as Chief Chaplain at the South Texas Veterans Health Care System. “These were the best years of my life, the happiest years,” Lesher says. She led a staff of 24 Chaplains and ministry students serving inpatient and outpatient Veterans throughout South Texas. Like other VA Chaplains, Lesher’s Staff Chaplains provided an array of activities such as grief and loss care, screening for risks to recovery, spiritual counseling related to organ donation, conflict resolution and ministry to Veterans in crisis or those at risk of suicide. She also expanded Chaplain Services from inpatient to community-based care. “As we know, healthcare is moving toward the outpatient area, so I believed that Chaplaincy needed to be there, too,” Lesher says. Lesher has served as the Chief of Chaplain Service at the South Texas Veterans Health Care System and Fargo VA Health Care System and as Chaplain at the Louisville VA Medical Center and Madison VA Medical Center. A main focus of the VA Chaplaincy is assisting Veterans in finding the way to better health through spirituality. “When someone doesn’t have a sense of meaning and purpose, that is usually when people become helpless, depressed, suicidal and feel like resigning at life,” Lesher says. She says her work over two decades to help these patients is informed by her own painful experiences with hopelessness, and the desire to serve Veterans impacted by war and service. Lesher once counseled a transplant patient experiencing the long-buried emotional burdens of war stemming from his service in Vietnam. Lesher says the Chaplaincy helped this Veteran find a “new spiritual heart” to go with his new physical heart. Another Veteran with traumatic brain injury was able to find his voice and communicate with his family by reconnecting with his faith, she says. 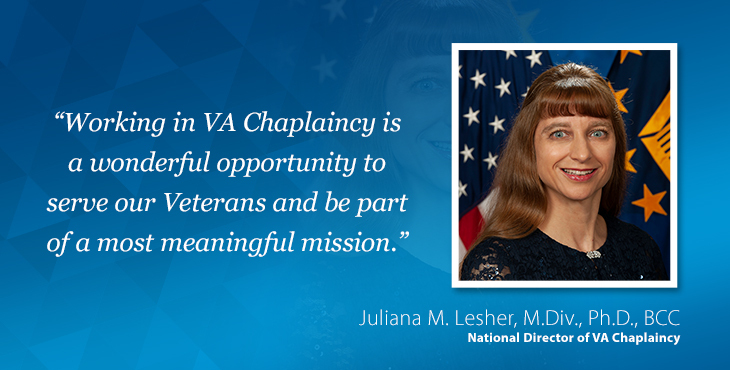 Lesher encourages those interested in VA Chaplain careers to visit www.VAcareers.va.gov and use the search function to explore “Chaplain” jobs on USAjobs.gov. Applications then go to the National Chaplain Center, where candidate applications are rated, ranked and sent to local VAs for the interview process. Before her promotion, Lesher received the 2016 VA Under Secretary’s Award for Excellence in Chaplaincy, the 2013 Distinguished Service Award from the Military Chaplains Association, the 2013 VA Secretary’s Heart and Hands Award, the 2009 VA Chaplaincy Best Practice Award and the 2008 VA Secretary’s Award for Excellence in Chaplaincy. See if a faith-based career caring for Veterans is for you: Choose a career as a VA Chaplain. EXPLORE and apply for an open position near you. LEARN how to Choose VA at VAcareers.va.gov. VIEW other posts in our #ChooseVALeadership Careers blog series. One more thought for everyone to ponder ‘ A pastor’s obligation to maintain confidentiality is not only a moral obligation, but also often a legal one…..